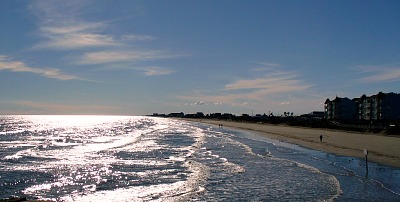 Galveston Beaches cover 30 miles of the Island. Discover your new beach! 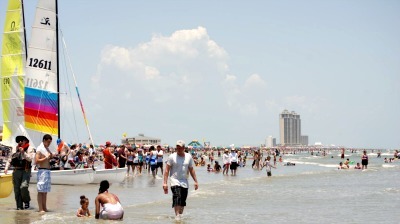 Galveston Beaches cover over 30 miles of the island. Beaches filled with sun, sand, surf, birds and beauty. Here you can walk for miles! And you're a stones throw away from amenities. Enjoy fabulous birds, and carefree laughter over the breaking surf. Feel that wonderful Gulf breeze? Smell the sun tan lotion? There are beaches to suit anyone. You’ll find the college crowd beach to family beaches. And beaches in between. There is one you can camp out on. Our favorite beach is Porretto Beach! We love it here. It is a rare family owned beach. And after a few visits you feel like family too. Of course in summer beaches get crowded. During holidays and Spring Break most certainly! But that's what there for! Jump in and join the fun. May to August seaweed occasionally washes up on beaches-I think it does on all Texas Beaches. Beach Patrol and Park Board will push it aside. It helps build the sand dunes we all like. If you have an aquarium shake that seaweed! Your bound to find something cool to put in it! One of the things we love about Galveston beaches is how close they are hotels and motels. And of course restaurants. Most of of time you can walk across the street and you are at the beach! Or a short bike ride and you are there! The seawall is about ten miles long. You'll see jetties all along it. These help collect sand for your toes to enjoy! The best time for Galveston Beaches is when there's been little rain. When its rainy water can turn green to greenish and sometimes sandy in color - like the surf at Cocoa Beach, Fl. Galveston has a Flag warning system for beach goers. They are prominently displayed. Different color flags indicate various swimming conditions to be aware of. Green Flag: Conditions are calm. Swim with care. Yellow: Caution should be used when entering a body of water. It is flown for normal conditions to remind people to stay alert. Red Flag: Usually indicates strong wind, large surf, or strong currents. Adult swimmers should not go more than waist deep. And children should stay near surf line. Blue Flag: Jelly fish, sting rays or other marine life that could be hazardous to a swimmer. This flag can be used along in conjunction with other flags. Orange Flag: Environmental warning for air, or water. 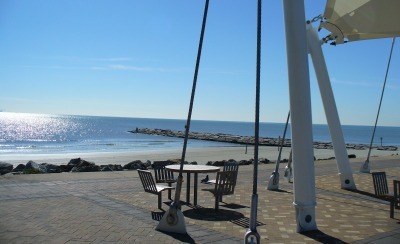 Leave Galveston Beaches and return to Galveston Travel and Charm Homepage.